A geothermal heat pump or ground source heat pump (GSHP) is a central heating or cooling system that pumps heat to or from the ground. It uses the earth as a heat source (in the winter) or a heat sink (in the summer). This design takes advantage of the moderate temperatures in the ground to boost efficiency and reduce the operational costs of heating and cooling systems, and may be combined with solar heating to form a geosolar system with even greater efficiency. Geothermal heat pumps are also known by a variety of other names, including geoexchange, earth-coupled, earth energy or water-source heat pumps. The engineering and scientific communities prefer the terms "geoexchange" or "ground source heat pumps" because geothermal power traditionally refers to heat originating from deep in the earth's mantle. Ground source heat pumps harvest a combination of geothermal power and heat from the sun when heating, but work against these heat sources when used for air conditioning. Like a refrigerator or air conditioner, these systems use a heat pump to force the transfer of heat. Heat pumps can transfer heat from a cool space to a warm space, against the natural direction of flow, or they can enhance the natural flow of heat from a warm area to a cool one. The core of the heat pump is a loop of refrigerant pumped through a vapor-compression refrigeration cycle that moves heat. Heat pumps are always more efficient at heating than pure electric heaters, even when extracting heat from cold winter air. But unlike an air-source heat pump, which transfers heat to or from the outside air, a ground source heat pump exchanges heat with the ground. This is much more energy-efficient because underground temperatures are more stable than air temperatures through the year. Seasonal variations drop off with depth and disappear below seven meters due to thermal inertia. Like a cave, the shallow ground temperature is warmer than the air above during the winter and cooler than the air in the summer. A ground source heat pump extracts ground heat in the winter (for heating) and transfers heat back into the ground in the summer (for cooling). Some systems are designed to operate in one mode only, heating or cooling, depending on climate. The setup costs are higher than for conventional systems, but the difference is usually returned in energy savings in 3 to 10 years. System life is estimated at 25 years for inside components and 50+ years for the ground loop. As of 2004, there are over a million units installed worldwide providing 12 GW of thermal capacity, with an annual growth rate of 10%. If deployed on a large scale, this technology may help alleviate energy costs and global warming. The heat pump was described by Lord Lelvin in 1852 and developed by Peter Ritter von Rittinger in 1855. After experimenting with a freezer, Robert C. Webber built the first direct exchange ground-source heat pump in the late 1940s. The first successful commercial project was installed in the Commonwealth Building (Portland, Oregon) in 1946, and has been designated a National Historic Mechanical Engineering Landmark by ASME. The technology became popular in Sweden in the 1970s, and has been growing slowly in worldwide acceptance since then. Open loop systems dominated the market until the development of polybutylene pipe in 1979 made closed loop systems economically viable. As of 2004, there are over a million units installed worldwide providing 12 GW of thermal capacity. Each year, about 80,000 units are installed in the USA and 27,000 in Sweden. Heat pumps provide wintertime heating by extracting heat from a source and transferring it to the building. In theory, heat can be extracted from any source, no matter how cold, but a warmer source allows higher efficiency. A ground source heat pump uses the shallow ground as a source of heat , thus taking advantage of its seasonally moderate temperatures. In the summer, the process can be reversed so the heat pump extracts heat from the building and transfers it to the ground. Transferring heat to a cooler space takes less energy, so the cooling efficiency of the heat pump again benefits from the lower ground temperatures. Shallow horizontal heat exchangers experience seasonal temperature cycles due to solar gains and transmission losses to ambient air at ground level. These temperature cycles lag behind the seasons because of thermal inertia, so the heat exchanger can harvest heat deposited by the sun several months earlier. Deep vertical systems rely heavily on migration of heat from surrounding geology, unless they are recharged annually by exhaust heat from air conditioning. Ground source heat pumps must have a heat exchanger in contact with the ground or groundwater to extract or dissipate heat. This component accounts for a third to a half of the total system cost. Several major design options are available for these, which are classified by fluid and layout. Direct exchange systems circulate refrigerant underground, closed loop systems use a mixture of anti-freeze and water, and open loop systems use natural groundwater. The Direct Exchange geothermal heat pump is the oldest type of geothermal heat pump technology. It is also the simplest and easiest to understand. The ground-coupling is achieved through a single loop circulating refrigerant in direct thermal contact with the ground (as opposed to a refrigerant loop and a water loop). The refrigerant leaves the heat pump appliance cabinet, circulates through a loop of copper tube buried underground, and exchanges heat with the ground before returning to the pump. The name "direct exchange" refers to heat transfer between the refrigerant and the ground without the use of an intermediate fluid. There is no direct interaction between the fluid and the earth; only heat transfer through the pipe wall. Direct exchange heat pumps are not to be confused with "water-source heat pumps" or "water loop heat pumps" since there is no water in the ground loop. ASHRAE defines the term ground-coupled heat pump to encompass closed loop and direct exchange systems, while excluding open loops. Direct exchange systems are 20-25% more efficient and have potentially lower installation costs than closed loop water systems. Copper's high thermal conductivity contributes to the higher efficiency of the system, but heat flow is predominantly limited by the thermal conductivity of the ground, not the pipe. The main reasons for the higher efficiency are the elimination of the water pump (which uses electricity), the elimination of the water heat exchanger (which is a source of heat losses), and the phase change of the refrigerant in the ground itself, allowing a higher temperature gradient between loop and ground resulting in a higher rate of heat transfer. While they require much more refrigerant and their tubing is more expensive per foot, a direct exchange loop is shorter than a closed water loop for a given capacity. A direct exchange system requires 1/3 to 1/2 the length of tubing and half the diameter of drilled holes, and the drilling or excavation costs are therefore lower. Refrigerant loops are less tolerant of leaks than water loops because gas can leak out through smaller imperfections. This dictates the use of brazed copper tubing, even though the pressures are similar to water loops. The copper loop must be protected from corrosion in acidic soil through the use of a sacrificial anode. Closed loop or 'wet' systems have two loops on the ground side: the primary refrigerant loop is contained in the appliance cabinet where it exchanges heat with a secondary water loop that is buried underground. The secondary loop is typically made of high density polyethylene pipe and contains a mixture of water and anti-freeze (propylene glycol, denatured alcohol, or methanol). After leaving the internal heat exchanger, the water flows through the secondary loop outside the building to exchange heat with the ground before returning. The secondary loop is placed below the frost line where the temperature is more stable, or preferably submerged in a body of water if available. Systems in wet ground or in water are generally more efficient than drier ground loops since it is less work to move heat in and out of water than solids in sand or soil. If the ground is naturally dry, soaker hoses may be buried with the ground loop to keep it wet. Closed loop systems need a heat exchanger between the refrigerant loop and the water loop, and pumps in both loops. Some manufacturers have a separate ground loop fluid pump pack, while some integrate the pumping and valving within the heat pump. Expansion tanks and pressure relief valves may be installed on the heated fluid side. 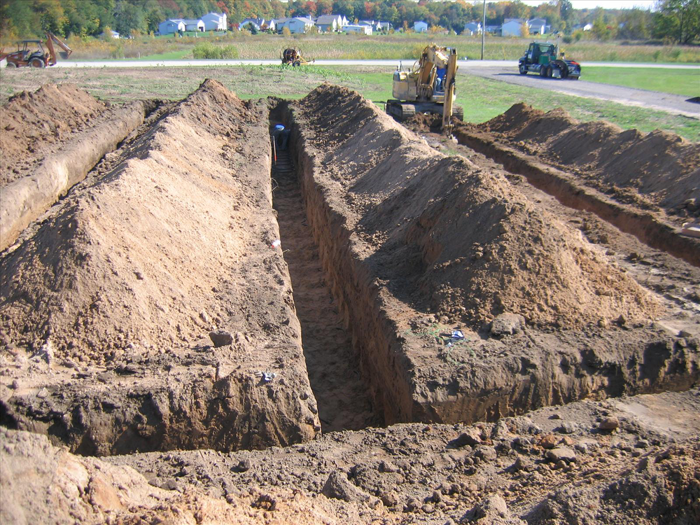 Closed loop systems have lower efficiency than direct exchange systems, so they require longer and larger pipe to be placed in the ground, increasing excavation costs. A vertical closed loop field is composed of pipes that run vertically in the ground. A hole is bored in the ground, typically 75 to 500 feet (23–152 m) deep. Pipe pairs in the hole are joined with a U-shaped cross connector at the bottom of the hole. The borehold is commonly filled with a bentonite grout surrounding the pipe to provide a thermal connection to the surrounding soil or rock to improve the heat transfer. Thermally enhanced grouts are available to improve this heat transfer. Grout also protects the ground water from contamination, and prevents artesian wells from flooding the property. Vertical loop fields are typically used when there is a limited area of land available. Bore holes are spaced 5–6 m apart and the depth depends on ground and building characteristics. For illustration, a detached house needing 10 kW (3 ton) of heating capacity might need three boreholes 80 to 110 m (270 to 350 feet) deep. (A ton of heat is 12,000 British thermal units per hour (BTU/h) or 3.5 kilowatts.) During the cooling season, the local temperature rise in the bore field is influenced most by the moisture travel in the soil. Reliable heat transfer models have been developed through sample bore holes as well as other tests. A horizontal closed loop field is composed of pipes that run horizontally in the ground. A long horizontal trench, deeper than the frost line, is dug and U-shaped or slinky coils are placed horizontally inside the same trench. Excavation for horizontal loop fields is about half the cost of vertical drilling, so this is the most common layout used wherever there is adequate land available. For illustration, a detached house needing 10 kW (3 ton) of heating capacity might need 3 loops 120 to 180 m (400 to 600 feet) long of NPS 3/4 (DN 20) or NPS 1.25 (DN 32) polyethylene tubing at a depth of 1 to 2 m (3 to 6 feet). As an alternative to trenching, the horizontal loop field may be laid by mini horizontal directional drilling (mini-HDD). This technique can lay piping under yards, driveways or other structures without disturbing them, with a cost between those of trenching and vertical drilling.